Since 2007, Stevens has been home to the Center for Secure and Resilient Maritime Commerce (CSR), the nation’s lead port security research and education center, which conducts innovative research, develops new technologies and delivers educational programs to enhance our nation's maritime security. What’s different this year is its leadership. In October, Dr. Julie Pullen took the helm as Director and began intensively focusing the CSR on proactively getting its tools and technologies into the hands of end users like the U.S. Coast Guard, the U.S. Navy and emergency first responders so they can be put to practical use. The CSR was created in 2007 after the Department of Homeland Security solicited proposals from academia for establishing Centers of Excellence aimed at conducting multidisciplinary research and developing education initiatives in areas important for America’s defense and safety. DHS’ goal was to take advantage of the unsurpassed research capabilities and intellectual capital of U.S. colleges and universities to fill knowledge and technology gaps in the department. One of the centers DHS wanted to create would be focused on maritime and island security, and given the strength of its renowned Davidson Laboratory for vessel testing and marine monitoring and forecasting, Stevens – with the University of Hawaii in Honolulu – was designated a lead institution in DHS’ Center for Maritime, Island and Remote and Extreme Environment Security (MIREES). MIREES is made up of two centers – Stevens’ CSR, which specializes in port security, and the University of Hawaii’s Center for Island, Maritime & Extreme Environment Security (CIMES), which focuses on remote and island security. Port security is, without a doubt, a pressing issue today. In its four-year history, the CSR has worked tirelessly to achieve its core vision of improving understanding of anything associated with “the maritime domain” – i.e. infrastructure, people, cargo and vessels that are in or near seas, oceans or navigable waterways – that could impact the nation’s security, safety, economy or environment. In fact, in its early years, the CSR’s observation, monitoring and prediction capabilities were critical in the emergency response to the recent Deepwater Horizon oil spill and the Hudson River US Airways plane incident, earning “Impact Awards” from DHS. Today, there are equally serious threats facing our ports – from climate catastrophes like the earthquake and tsunami in Japan to worst-case terrorism scenarios like dirty bombs and improvised nuclear devices brought ashore via hijacked small vessels. Resources and knowledge cannot be holed up in academia; they must be at the fingertips of first responders. “Ports can be especially vulnerable because they are usually located near major urban metropolises,” Dr. Pullen said. 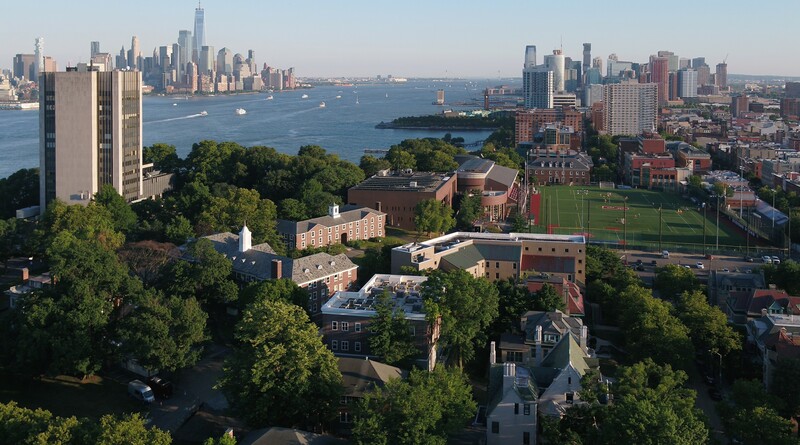 With its numerous academic, public and private partners, Stevens and the CSR is currently involved in three port security vessel detection research projects – space surveillance, HR radar and over-the-horizon surveillance, and nearshore and harbor surveillance. Each project is aimed at developing processes, systems, sensors and algorithms for better detecting and tracking ships in harbors, seas and oceans. Other research is focused on monitoring and forecasting ocean conditions and weather that might threaten ports, and yet another research project works to build a more resilient maritime transportation system by developing essential tools and processes to improve preparedness, response and recovery. Under Dr. Pullen’s leadership, all of the CSR’s work has the ultimate goal of moving beyond situational awareness to be able to predict and respond to security situations before they get out of hand. She brought to the CSR personal expertise in this area – especially predicting chemical, biological and radiological dispersion in coastal cities in the event of a terrorist or accidental release. She was a principal investigator on a DHS project to improve such prediction capabilities by integrating multi-scale modeling of air, sea and buildings, and was also a member of the management team for the midtown Manhattan 2005 Urban Dispersion Program tracer release study, the largest of its kind in the U.S. She also pioneered the two-way linkage of a high-resolution mesoscale atmosphere and ocean model for realistic applications in the coastal zone, which resulted in superior forecasts and led groups like the Navy SEAL’s to put a state-of-the-art, high-resolution, globally relocatable coupled ocean, atmosphere and wave model into operational use. In addition to managing its research initiatives, Dr. Pullen is helping the CSR continue to meet its educational mission to develop the maritime security workforce by transferring its research into highly relevant graduate education, professional development programs, and innovative K-12 programs and workshops. The CSR offers maritime systems master’s degree fellowships and summer internships. It also runs a Summer Research Institute (SRI) where undergraduate and graduate students from all over the country can take part in hands-on maritime security research, as well as workshops that introduce K-12 teachers to port security applications in collaboration with Stevens’ Center for Innovation in Engineering and Science Education (CIESE). According to Dr. Pullen, it is some of the student work that leads to the biggest breakthroughs that can really help first responders in the field. SRI students from the 2011 program, for example, helped develop a maritime security technology called Magello that pulls together disparate maritime modeling and data sources into one easy-to use-web interface to provide critical, real-time environmental data needed to make informed emergency management decisions, especially related to radiological threats to ports. It is generating great interest among representatives from the U.S. Coast Guard and other agencies. Beth DeFares, Director of Education for the CSR, credits Dr. Pullen with the leadership and oversight that allowed this year’s SRI students to reach such unprecedented levels of success. Dr. Pullen’s vision of applying the CSR’s research and activities in the real-world was also evident in the Magello project. “Julie was able to finally push students to integrate different projects that have been taking place across Stevens for so many years,” said Talmor Meir, a Ph.D. student in Ocean Engineering who is affiliated with the CSR and involved in building Magello’s atmospheric model. To learn more about the CSR, visit http://www.stevens.edu/csr/.